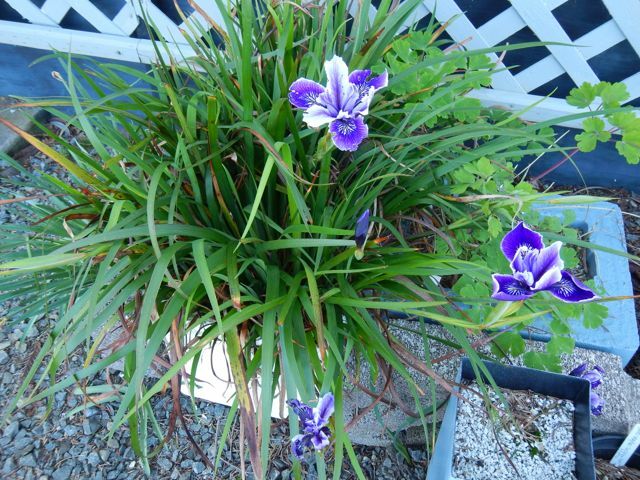 Amazing progress has been made in the relatively few years in which Louisiana irises have been hybridized. Those stalwarts who collected wild irises in swamps and along bayous and who began hybridizing in the 1930s and 1940s would be hard pressed to recognize some of the newer hybrids. Even those working in the 1980s and 1990s surely would be surprised by their change in appearance and pleased with improvements in performance as a good garden plant. I generally like the new irises and have been impressed by almost all. Those marked by the greatest transformation in appearance of the flower, however, are not necessarily the ones I am happiest to see every year. Don’t get me wrong. Ruffling is great. Green styles can be pleasing. Signals on all parts add nice variation. Strong substance generally is a plus. Who can argue that a high bud count is not better than a lower one? There is something to be said, however, for old friends, old forms, and for simplicity and grace. I think those qualities may be what makes me happy to see some favorite irises each year and to resist any urge to move them out to make way for the new. This blog will be about some iris hangers-on. A few are actually old, but others simply hearken back to the time before the ruffling revolution, which really began not so long ago. 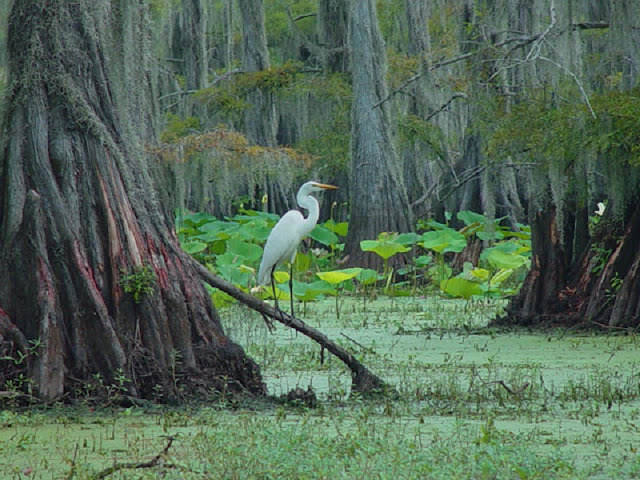 Even some new irises channel the quintessence of the wild ones and reinforce a prime directive for Louisiana irises: There are a variety of pleasing forms, not a single model for a good iris. And, it should be added, it is the appearance and performance of an iris in the garden that is the real test of its quality. A good place to start is ‘Plum Good’ (Nelson, 2001). This iris was developed by the late Ira S. Nelson, probably in the 1950s, but was only registered by his widow Barbara many years later. 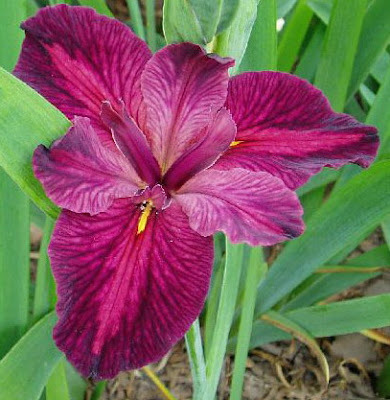 The intensity of the plum red color and bright yellow arrowhead signal make this one striking iris. The form is a bit open and slightly flaring, creating a bold but airy effect in the garden. Many old irises drift away, but iris gardeners have refused to let this one go. If red is your color, ‘Acadian’ (Conger, 1956) remains appealing. It was registered as “violet rose” but I don’t see that. To me, the falls are distinctly red heavily overlaid with wine veining. True, the standards are a lighter color, and violet rose may be accurate, but the overall effect of the flower is a textured red. I don’t know of anything else quite like it even after all these years. Dorman Haymon’s ‘It’s A Boy’ (Haymon, 1989) is an overlooked iris. It is a clear lavender blue with a strong yellow arrowhead signal outlined deep blue. The flower form is open. The registration blurb tags this iris as blooming at midseason, but after three years I have yet to find that accurate. It is one of the last irises of the season, and it thus recommends itself to the procrastinating yet discriminating hybridizer. ‘It’s A Boy’ provides a very beautiful and welcome surprise when the bloom season seems almost over. Color distinguishes ‘Velvet Memory’ (Morgan, R, 1994) and I look forward to seeing its face every year. Richard Morgan registered it as “dark red violet” and I can’t disagree as far as that goes. But there is something about the tone that is distinct. I have called it violet purple but that probably is no more accurate. I’m not sure that my pictures or monitor capture the color or that any other iris has duplicated it. My current favorite Richard Morgan iris is ‘Morgan’s Dixie’ (Morgan, by Melody and Jerry Wilhoit, 2009). It is a short bright gold that is edged terracotta. It provides a vivid-to-nearly-blinding patch of orange in the garden. This, as they say, as one that you can’t pass by, but partly that’s because it reaches out and grabs you by the ankles. I cannot imagine a replacement for this one. ‘Morgan’s Dixie’ proves that an iris does not have to be tall to stand tall. Double Louisiana irises may be an acquired taste and if so, I have acquired it. They are oddities, really, and perhaps are best enjoyed if few in number. One I like is ‘Creole Canary’ (Granger, 1976). It is “double” in the extreme, having six falls and a bunch of extra petaloids too numerous to count precisely. One might say it’s a mess. It is, but I enjoy looking at it every year. ‘Henry Rowlan’ (M. D. Faith, 2000) is hardly an oldie, but it demonstrates that a clean, simple form devoid of ruffling (much less doubling) retains a strong appeal. This is a gorgeous velvety purple iris that I never expect to replace. The contrasting bright yellow of the crown signal is striking. Someday this totally unruffled form may represent the new novelty iris. As might be expected, I am attached to several of my own hybrids. I still like these, but they may not grab others. 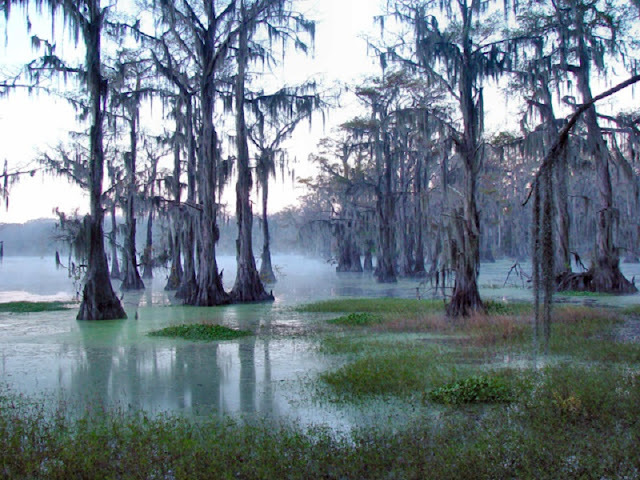 They include ‘Barataria’ (2002), ‘Little Woods’ (2004), ‘Gentilly’ (2003), ‘Cocodrie’ (2013), ‘When Pigs Fly’ (2013) and ‘Zydeco’ (1999). 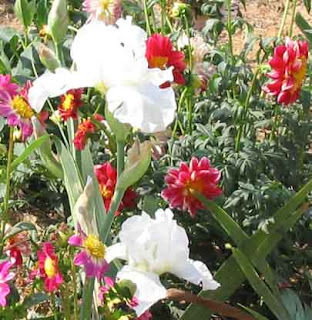 ‘Barataria’ is one of those irises that do not have show stalks, but they are produced in such profusion that a clump provides a color blast approaching that of a blooming azalea. The day-glo rose color and contrasting white styles are an early highlight in the garden. ‘Little Woods’ is a softer color – a warm rose – that is best appreciated close up. The styles and signals have a subtle greenish cast and a line of deeper rose decorates the center of the falls. One of the best smaller Louisiana irises. ‘Cocodrie’ defies the demand for overlapping petals but its flaring form, orange color and decorative signals underline the Louisiana standard that many forms are fine. This is another iris that slows your stroll down the garden path. ‘When Pigs Fly’ exerts the same pull with a unique combination of pearly pink and yellow signals outlined by bright fuchsia. 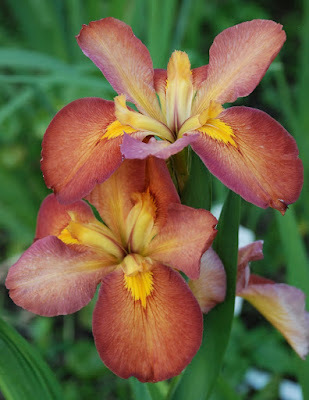 This iris was named for its possibility of winning a Dykes, but at least there is no mistaking this one for any other. It’s a fun iris. ‘Gentilly’ is a favorite due to its soft peach tones and tastefully decorated styles showing a hint of green but tipped rose, and with a yellow signal outlined deep orange. That may sound busy but the color contrasts are subtle, not garish. This iris is best enjoyed out of the full blast of all day sunlight. It definitely does benefit from partial shade. 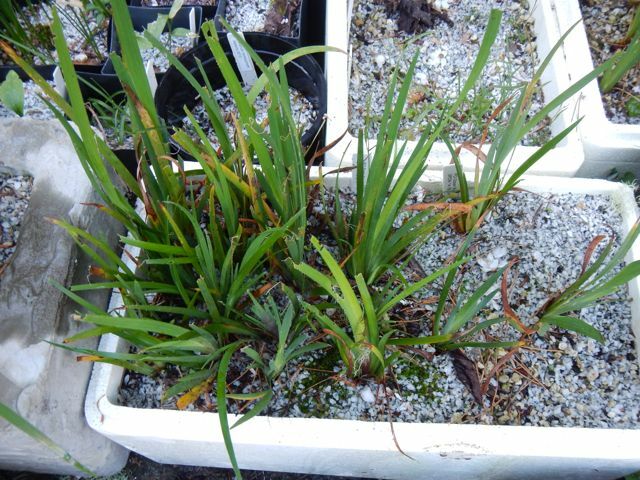 ‘Zydeco’ returned to form this year when planted again in a garden bed rather than under water culture. There aren’t many, but a few Louisiana irises prefer to grow in a garden bed rather than in the bogs I create with drainless containers. ‘Zydeco’ is a bright burnt orange self that deserves to be treated the way it wants. Perhaps eventually I will tire of some of these old iris friends, as I have others. I do like to think they retain some of the character of their wild ancestors. It has become clear that the genetic possibilities for development and transformation of Louisiana irises are practically limitless. Someday they may be unrecognizable as products of the natural world. I hope that future Louisianas maintain qualities that reflect the essence of their natural heritage, and that we will not be entirely dazzled by beautiful images more likely to inhabit the far end of a kaleidoscope. As I write this, I'm just coming off a spring season that was among the strangest I've seen in thirty plus years of breeding rebloomers. There have been springs with drought and springs with incessant rain. This year, spring started back in the winter. 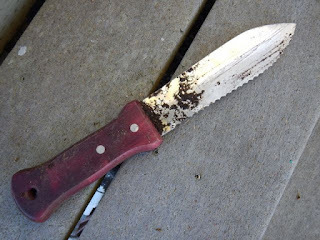 This was good, because I was able to do a lot of garden cleanup and repair before the bloom season got started. Then, the season was two to three weeks early. One positive to this was that everything bloomed out of order, with a second wave of rebloom stalks at the end of the regular season. For instance, 'Tara's Choice' is usually one of the first to bloom, but bloomed at mid to late season this year. 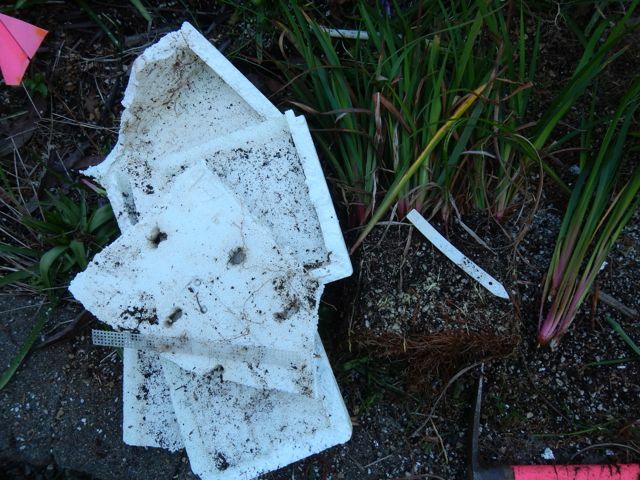 It was good to see a few new iris faces, new seedlings, and some slightly older, but favorite faces. Hybridizing reblooming irises can be a difficult challenge depending on your location. I'm in South Central Kentucky, zone 6. Why is this important? It's beginning to look more and more, to this hybridizer, like breeding irises in general, and rebloomers in particular, is a regional job. If you live in an area where recurring iris bloom is the norm, then perhaps you wouldn't understand how other regions of the country, the eastern US in particular, long for irises that bloom from frost to frost. Although I can get tunnel vision when I'm out in the garden every day working with the irises, and making crosses, we are not thinking only of ourselves, but also the thousands of people hoping for a group of irises that will bloom from spring through fall, since many gardening people want the beauty of the iris throughout summer. Less than half a dozen people are working toward rebloom in the colder climates, zones 5-7, and we are all in different parts of the country. It is a struggle to find cultivars that work for all of us. We have different favorites and have produced different cultivars of our own. Although many of us consult and talk among ourselves, we are each working for things that will rebloom in our own gardens, and hopefully, for others. For more information search through the Reblooming Iris Society @ www.rebloomingiris.com. Several of us can be found on "Reblooming Irises" and "Iris Hybridizers" on Facebook. 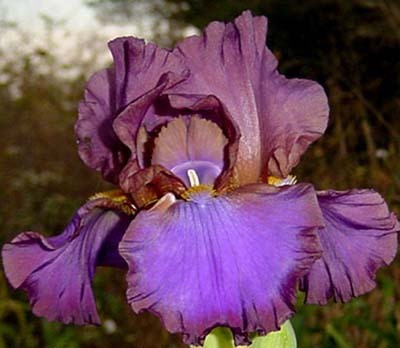 We enjoy talking about irises in general and rebloomers specifically. Garden presence. That's what I get from another one of my favorite irises, 'Plum Pretty Whiskers.' All of my favorite photos of my garden feature this iris. It bloomed on and on during the two fantastic springs of 2012 and 2013 here in Southern California. I have it planted with foxgloves, purple violas, lamb's ears, paludosum daisies, and roses. 'Plum Pretty Whiskers' was registered in 2003 by Don Spoon. It is listed as growing to 35" and blooming mid- to late-season. It is shorter than that in my garden, with nice straight thin leaves and double-socketed buds. It blooms mid-season here. As you can see in the photo above, the falls on this variety "pinch", but that does not detract from its overall impact, in my opinion. Sometimes the dark spot on the falls is large and solid, and sometimes it is thinner and wispy looking. I like the variability. 'Plum Pretty Whiskers' reblooms here in Southern California on occasion, but Virginia Spoon tells us that it was not registered as a rebloomer. It is so pretty that I don't require it to rebloom (like I do with 'Total Recall' in the foreground). 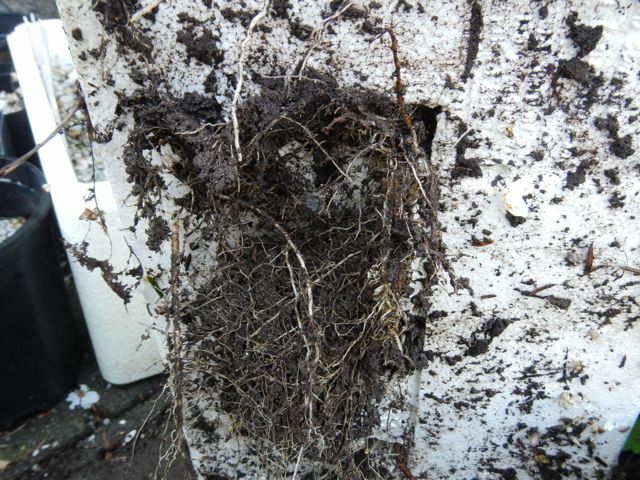 After I overwatered it last year in the heat of summer, I almost lost it to bacterial rot. 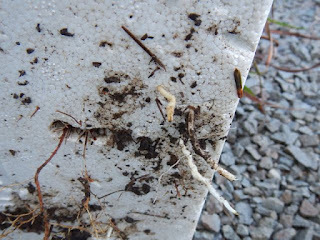 I managed to save it by digging up the healthy rhizomes and potting them up and moving them to the shade for the remainder of August and September. The plants have not yet fully recovered, but they did bloom this spring. Perhaps by next year, I will have more photos of this lovely iris to share.